She’s designed cakes for Brad Pitt, Cher and a slew of others, but celebrity baker Marina Sousa is as friendly and down-to-earth as they come. Read about her “blessed” beginnings, breaking news and exciting plans for the future in this enlightening, in-depth interview. When Marina Sousa was tasked with creating an erupting volcano for her fifth grade science class, she opted for different materials over the traditional papier-mâché. Having just completed a Wilton class (the one and only cake decorating class she’d ever take), Marina used a doll dress pan and the Wilton star tip to make a chocolate volcano cake. Her classmates and teacher were impressed with her creativity and delighted to enjoy an unexpected treat. 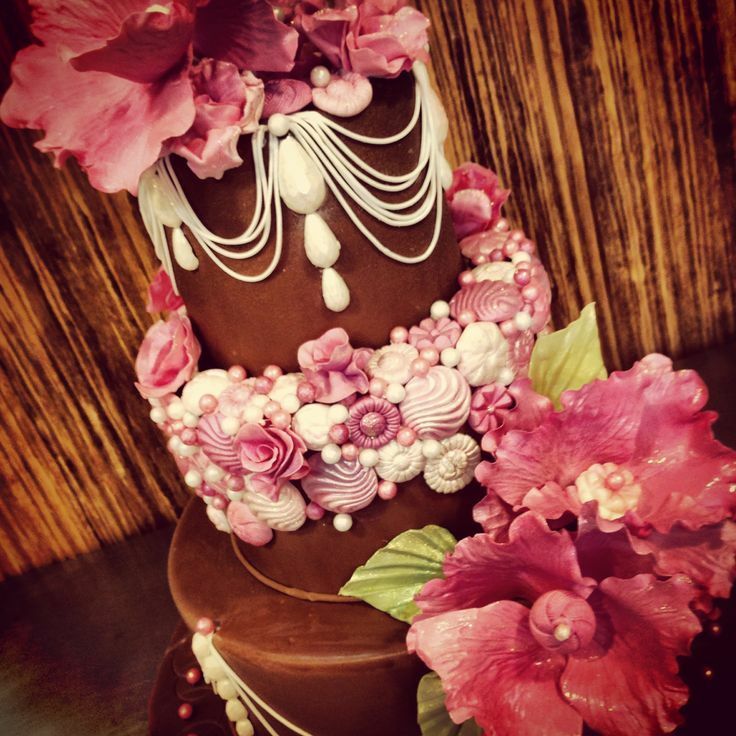 Perhaps even more unexpected, however, was the fact that they were the first in a long list of Marina’s cake clients that someday would include Brad Pitt and Oprah Winfrey. Baking, though, was neither her first nor second career. At just 16, Marina was accepted via early admissions to the Fashion Institute of Design & Merchandising, and began taking classes on the San Francisco campus only two weeks after graduating high school. She studied Visual Merchandising & Space Design, and after earning her degree, started an internship at the city’s FAO Schwartz doing window displays. “It was totally fun working with toys and building these over-the-top displays,” she recalls. After a while, however, she began looking for her next adventure. This new passion spurred Marina to return to school fulltime, and she enrolled at the California Institute of the Arts in Valencia. There, she earned her graduate degree in theatrical production management. Ready for a break, Marina quit. “I literally left there without a clue what my next step was going to be,” she remembers. “I just decided to take some time off because I hadn’t not worked since high school.” It was in the midst of what she calls her “self-imposed time-off timeline” that her cake career began. “I was meeting a friend for lunch in the Beverly Hills area, and I parked in front of a shop called Rosebud Cakes,” she explains. “I was fascinated by their windows, and I went in to check it out.” For the next hour, Marina and her friend examined the shop’s books, sampled cakes and chatted with the staff. Bored not working, Marina thought it would give her something to do while she looked for a “real job.” She walked out of the shop that day newly employed and within a couple of weeks, she was using slow periods at the front counter to learn decorating in the back. Two months later, she was a full time cake artist. 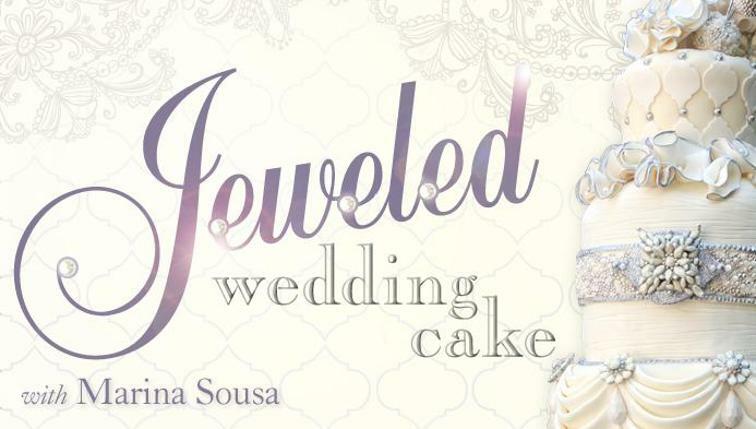 Over the next two-and-a-half years, Marina became one of Rosebud Cakes’ top designers, serving Hollywood clientele that included Raquel Welch, Cher, Goldie Hawn, Will Smith and Jada Pinkett Smith, plus a host of others. 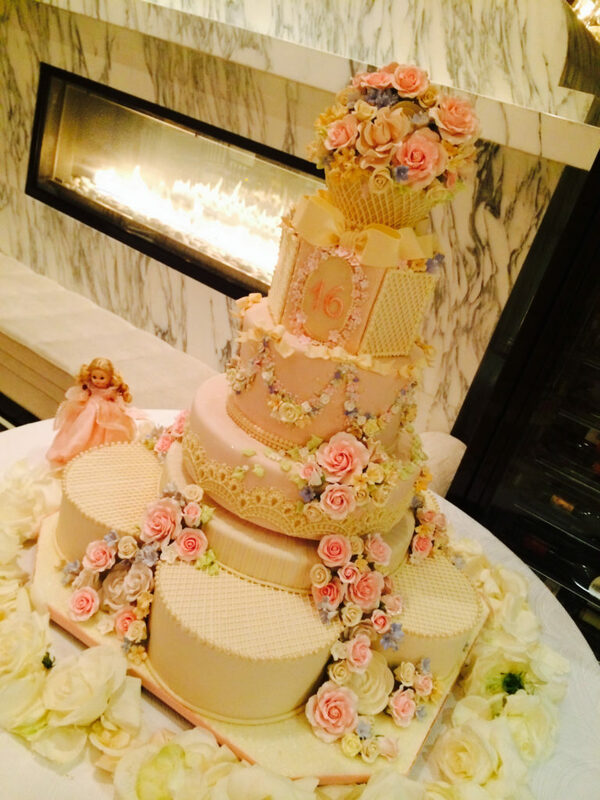 She even designed the wedding cake for Brad Pitt and Jennifer Aniston. 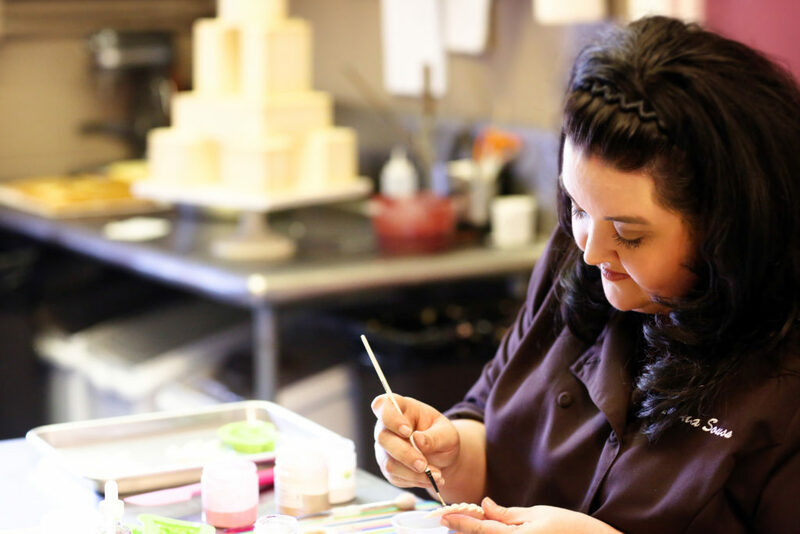 With respect for the “science” of baking and understanding that her cakes needed to taste as good as they looked, Marina enrolled in the Baking & Pastry Arts program at the Culinary Institute of America in Napa. After graduating top of her class, she returned to the beach community where she grew up, just south of San Francisco, to contemplate her next move. “I’d intended on going back to L.A. to open my business there, but after being in the wine country for a year, I found it pretty hard to do that,” she explains. Still, while friends and family tried to convince her to launch her business in her hometown, she wasn’t confident it would work. To counter the urgings of her friends and family, Marina says, “I put up every excuse I could think of, and one of my first ones was that I didn’t have a commercial kitchen to work out of.” Call it divine intervention, the power of networking or just plain luck, but the issue of having no kitchen was quickly resolved. Though she was feeling fortunate and grateful for the warm welcome, Marina knew her place in the school’s kitchen was temporary. “The school was going to be transitioning into a summer camp in June, so I was worried I’d have no place to work when wedding season hit,” she says. The next major move for Marina was right around the corner. 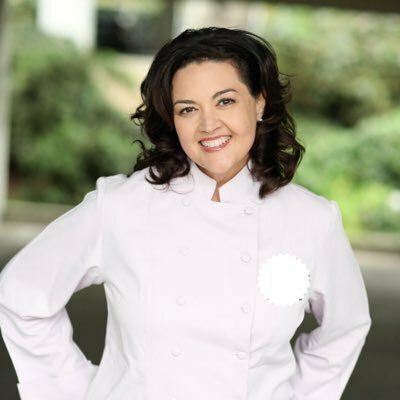 After being in business for less than five months, she got her first call from Food Network. “They’d just filmed an annual cake competition in Beaver Creek, Oregon, and though they hadn’t planned it at the time, it turned out to be the pilot episode for Food Network Challenge,” she explains. “When they called me, they were casting for the very first thing to be officially produced as Challenge. Since it hadn’t aired yet, I had no idea what they were talking about, and the whole thing just sounded crazy to me. Following that, Marina made six more appearances on Challenge, and then filmed Last Cake Standing. Perhaps most notable for personal reasons, however, was her appearance on The Oprah Winfrey Show. What began as a “random phone call” on a Friday afternoon ended with her fulfilling one of her mother’s prophecies five days later. The producer explained that they were planning a show about reality television, and asked if Marina could be in Chicago that Wednesday with the “biggest and best cake” she’d ever made in her life. “Just something that would make Oprah’s jaw drop – that was pretty much all the direction we were given,” she says. After sleepless nights and lots of legwork, Marina and her friends shipped 17 boxes to Chicago and took more with them on flights there. 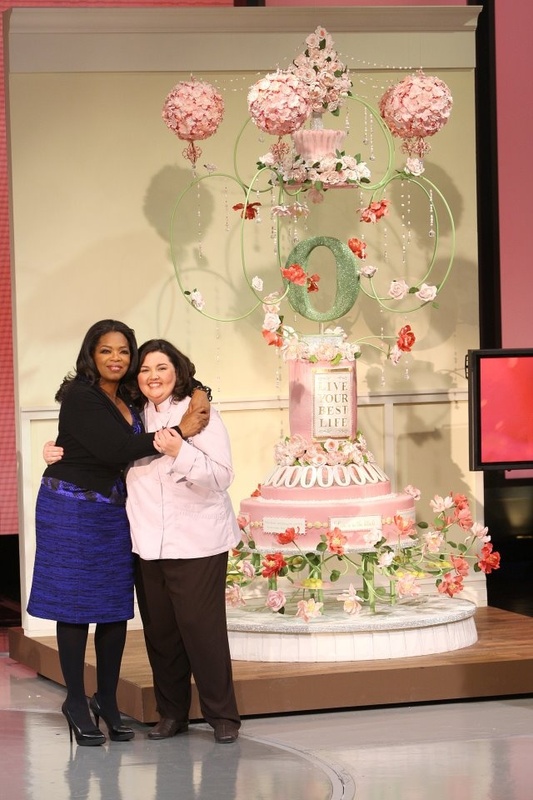 What resulted was an incredible 11-foot tall cake that wowed everyone, including Oprah herself. Creating the masterpiece from concept to completion within a matter of days kept Marina so focused, she didn’t have time to contemplate the amazing fact that she was about to see her mother’s prediction come to fruition. That moment of reflection came just as she was about to walk out on stage, and it was one she will treasure forever. “They had built these swinging bakery doors and said they wanted us to ‘bust’ out of them, and I was just kind of laughing because I wasn’t even sure what that meant,” she recalls. “Oprah had just done the intro to the show, so she was on stage, on the other side of the doors. They brought in the announcer for the Chicago Bulls to introduce all of us, and as he was doing my big lead-up announcement, getting ready to say my name, a light from above me backstage slowly came on. Of course, she doesn’t regret the television appearances. “It’s definitely been a fun ride,” she says. 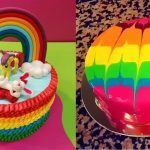 And though some might assume her cakes are beyond their budgets, plenty of others have learned that while the tastes and designs are exceptional, her prices are competitive for her market. Her monthly cake orders range from just a few during slow periods, to well over a dozen during wedding season. But her limited travel doesn’t mean there still aren’t great opportunities to learn from Marina. 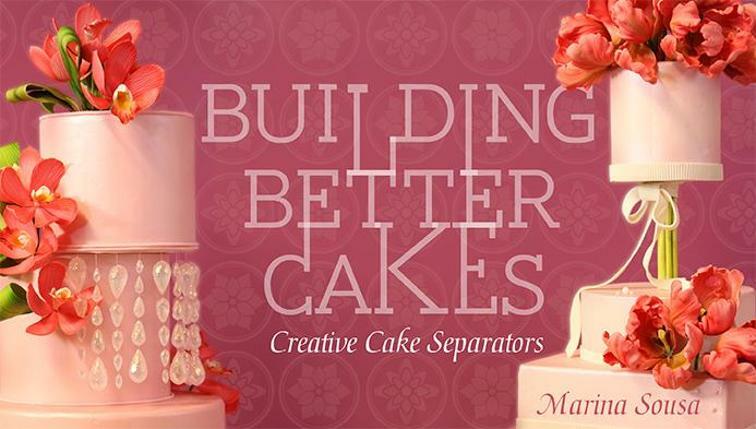 This October, she’ll be one of 17 instructors teaching at the first-ever Cake Camp UK in Nottingham, England. 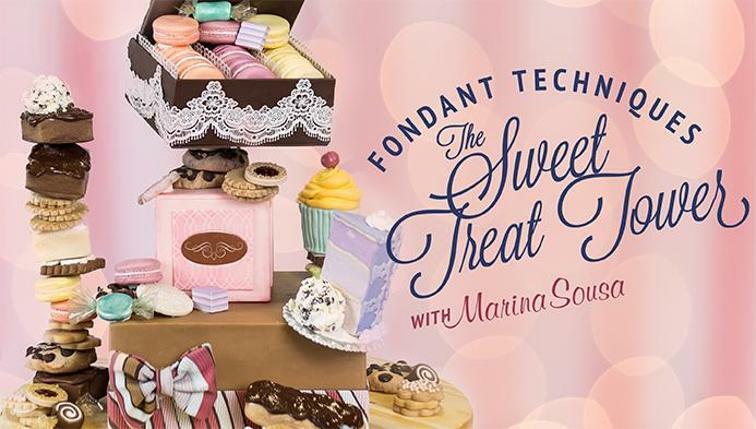 For those who prefer to stay closer to home, she’ll be teaching at the French Pastry School in Chicago in June, and she also offers four courses on Craftsy.com. 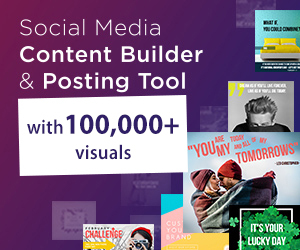 Her inspiration isn’t limited to details divulged during client consultations, though. “I take a lot of pictures while I’m traveling,” she says, “and most of my pictures are of windows, doors or some sort of ironwork or that kind of thing.” Little details on these architectural elements can find their way into her cake designs. 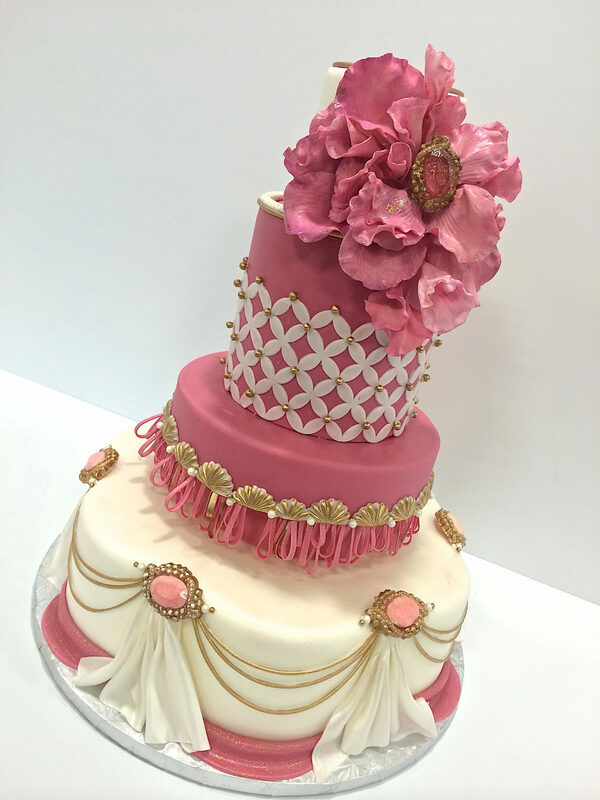 “I love texture, and it’s one of the first things I consider when designing a cake,” she says. “Some of my favorite cakes are just white on white. I think the biggest challenge is to create texture with a monochromatic color scheme, and that could be through embossing, hand painting, sculpting or applique-type designs. 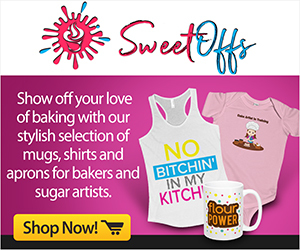 Opening her retail website, she says, is part of “that master plan.” By creating an additional revenue stream with the website, she hopes to free up the time needed to work on the book. 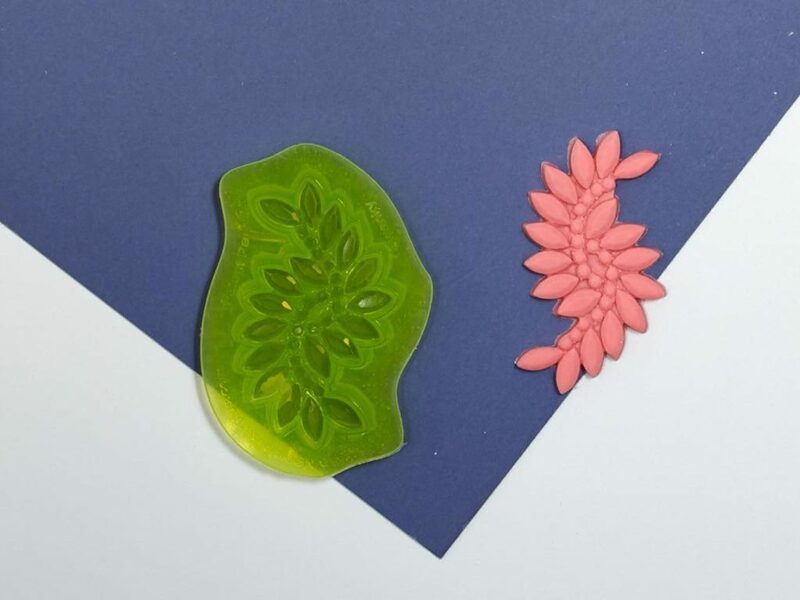 Among the genuine, quality products featured on her new site are her designs from Marvelous Molds. “Those were the result of a wonderful collaboration with Dominic Palazzolo from Marvelous Molds,” she says. 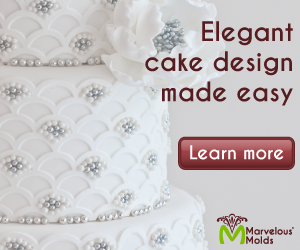 In addition to nine sugar bead molds, Marvelous Molds offers seven button molds and 15 jewel molds in Marina’s collection. More is being added to the line this November. .
“I think molds are a great way to increase consistency and productivity,” she comments. “Back in the early days, especially with Challenge, people thought that using molds was an easy way out. They’re more accepted now than they used to be, though. 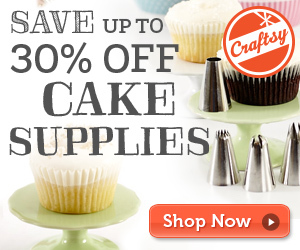 So in addition to using tools to your advantage, what other advice would Marina give to aspiring cake artists? “If you want to make a business out of it, my one question would be, ‘Are you sure?’” she says. “I think people get into it because they’re passionate about what they do and they don’t really realize everything that’s entailed in making a successful business. And those in her fifth grade science class who delighted in her chocolate volcano cake would certainly agree that unique design, when executed well, is a goal worth striving for. 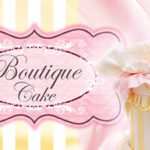 For more advice, instruction and inspiration from Marina, look for her on Craftsy.com and visit www.justcakeshop.com.